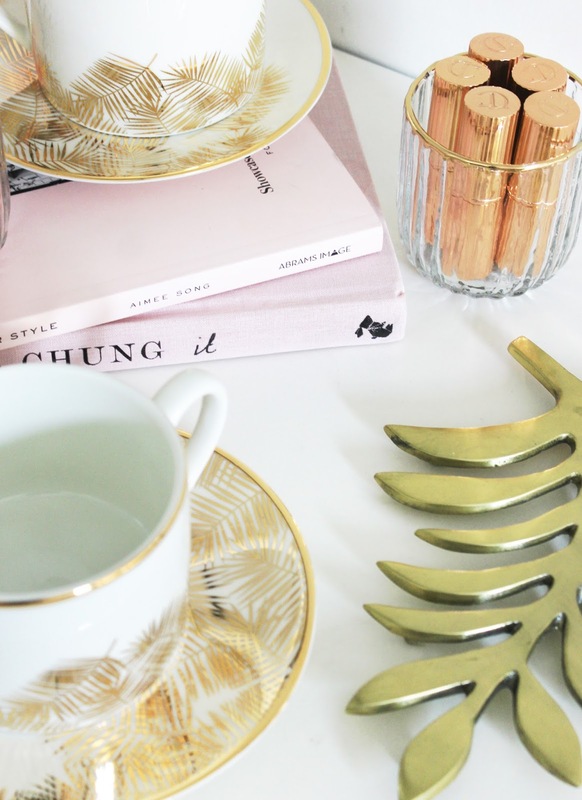 My love affair with homeware is no secret – and I get incredibly excited when I find gorgeous new pieces at affordable prices. One such place is definitely H&M Home. The range changes each season with new home accents and decor which are completely on trend, yet without the steep price tag. I went on a little browsing spree a few weeks ago and bought a few new pieces from their website – a because they’re so beautiful, I thought I’d show you what I chose. 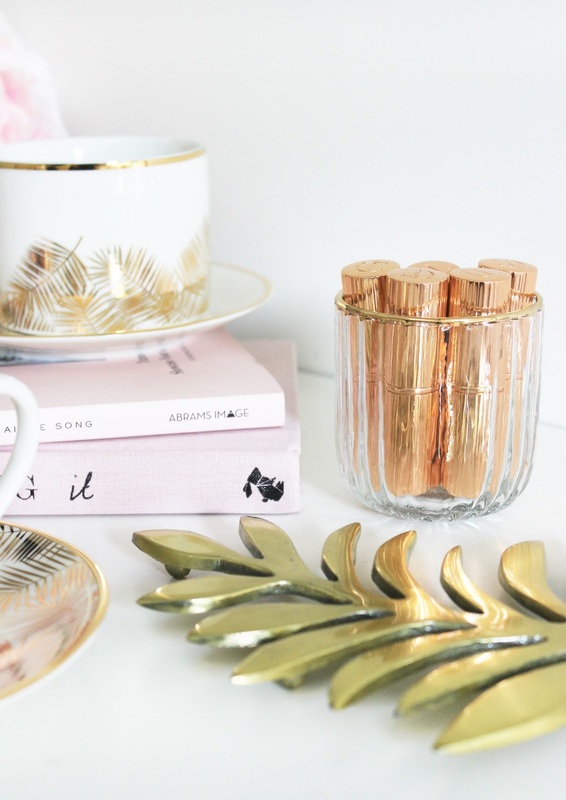 When bloggers write up their H&M Home Hauls, one of the bits you’re almost guaranteed to see are a couple of metallic mugs (and I’m no different). The quality of the mugs is fantastic, they’re white porcelain, medium sized and they come in a lovely range of different designs. 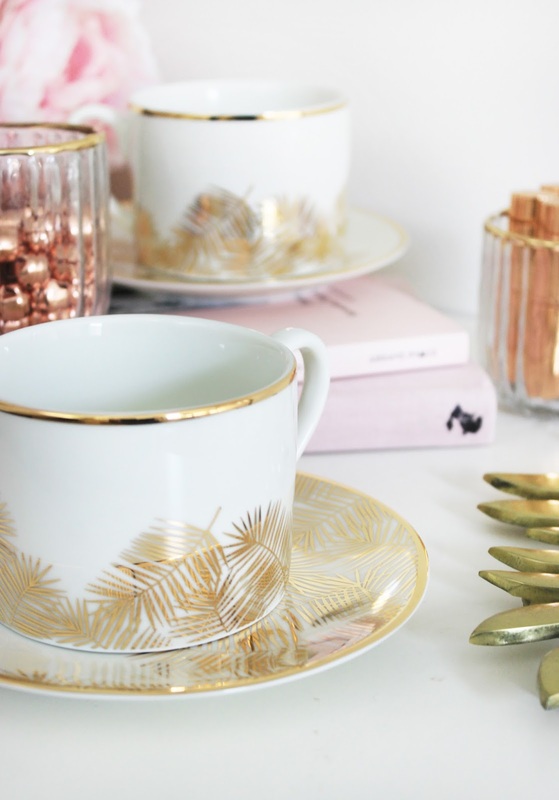 The newest pattern that H&M have released for this season has been gold feathers, so I chose two mugs with golden feathers around the base – aren’t they just stunning?! Of course, to match the mugs, I needed saucers, and H&M just happened to have the perfect ones. Again, white porcelain, decently sized and they work well as general plates as well if you’re not wanting the mugs. They’re also half covered in golden feathers, with a soft golden rim around the edge. It’s such an elegant collection, and for the price, it certainly looks like it’s worth a lot more than I paid for it! Speaking of golden rims, I saw these beautiful little ridged glass tealight votives which I instantly fell in love with. I’ve seen several bloggers mention the drinking glass version of these which is what I was actually after, but as those were out of stock, I decided to settle for these smaller jars. I don’t actually use them for burning tealights – I’ve found that they’re the perfect size to store pretty lipsticks and little trinkets so that’s what I’ll keep these beauties for. Last but not least, I’m sure you might have seen this golden feather (there’s really a theme going on here, isn’t it?) trivet around on lots of Instagram feeds. It’s such a perfect blog prop and table accessory, so I’m happy that I picked it up. What made it even better was that it was in the sale – I think I managed to get it for around £3 – but that does mean it’s probably selling out fast, so grab one while you can! Have you seen the new H&M Home range?